Menai Bridge station was closed in 1964, but the ornate station building survived into the seventies. The platform was actually at first floor level, so it was a much bigger building than it appeared from the railway side. Originally it had 4 platforms, 2 on the main line and 2 on the Caernarfon branch, connected by subway. Although very close to the structure it took its name from, it was actually in a different county from the small town it served. 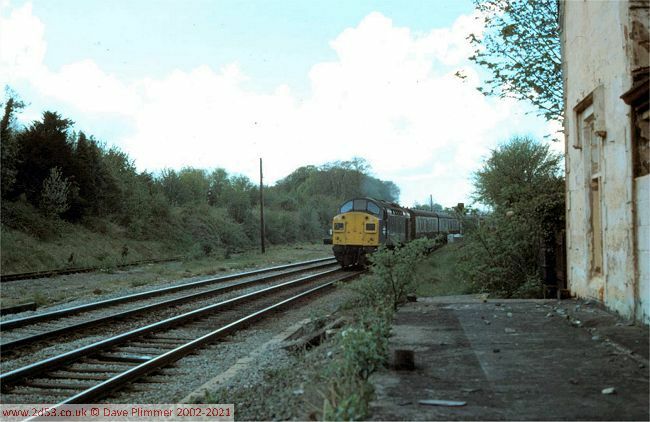 Here is a set of pictures taken on the 14th May 1977. 40126 passes Menai Bridge on 1A60, 13:20 Holyhead to Euston service - normally a class 47 working. Although it appears that the up main platform survives, it was in fact a new concrete structure built for loading cattle onto railway trucks during the closure of the Britannia Bridge between 1970 and 1972. Just visible are the bases of the posts for the fencing used to corral the cattle. According to www.holyhead.com, 105,000 cattle were transhipped here between November 1970 and January 1972. 47456 passes westbound with 1D56 10:00 Euston to Holyhead. As well as the almost intact station building, the derelict signal box is also still present. 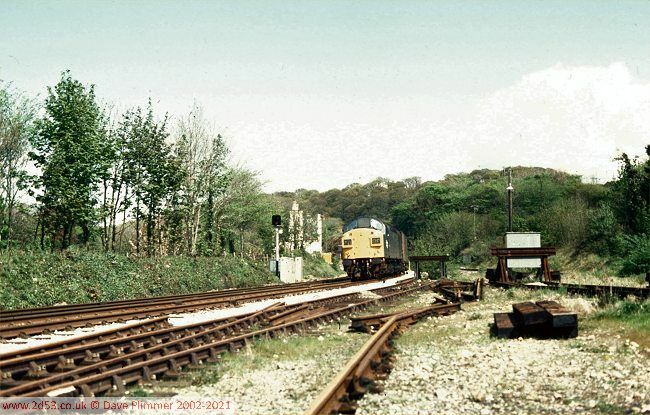 The overgrown track in the foreground is the remains of the Caernarfon branch - still connected to the main line but secured out of use. This track ended a few yards further on - at the point where the connection to the marshalling yard diverged. Next up is 40137 running out of sequence with 4D59 11:25 Trafford Park to Holyhead Freightliner. 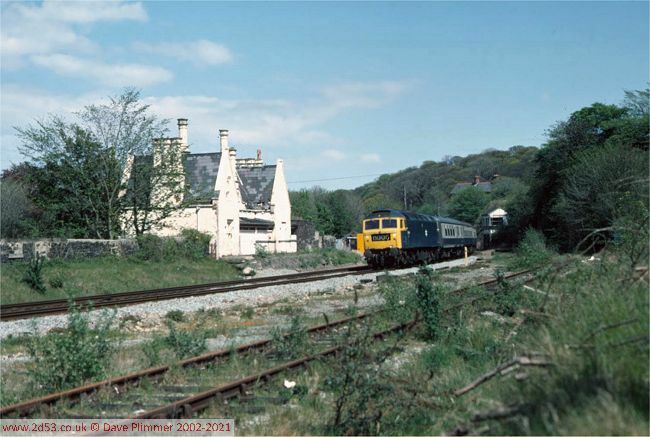 According to the WTT, this should have been behind the next train (see below), with a 7� minute wait at Gaerwen until 2D94 cleared the block section to Ty Croes, so an early arrival at Holyhead FLT looks likely for 40137. The two east end headshunts for the yard sidings are seen here. The left one protected the connection to the Up main line (far left) and the right one the connection to the Up Caernarfon line (off to the right), but by this time both those connections had been lifted. 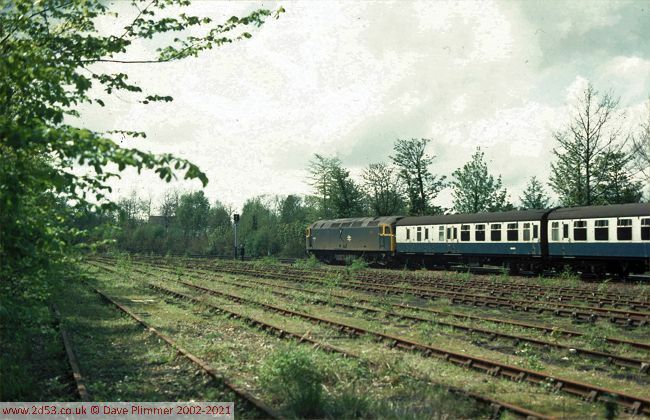 Next to pass is a 2-car Park Royal DMU formed of M56156 and M50399. This is working the 2D94 14:47 all stations Bangor to Holyhead. An unexpected sight was 47169 on an ECS working for Holyhead. 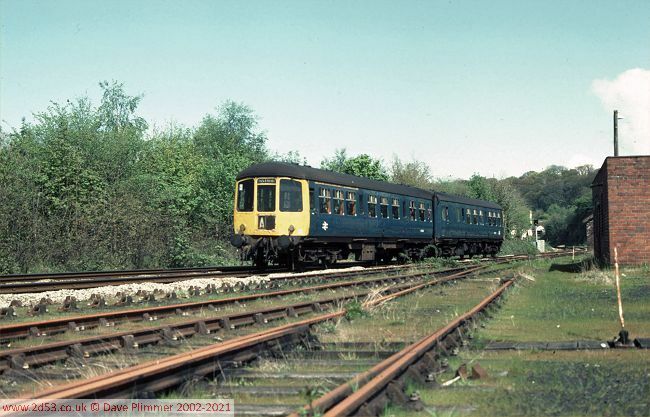 The most likely explanation was that this is 5D74, the 15:00 Llandudno to Holyhead, running about 45 minutes early. This is quite feasible; it had worked the 10:33 Manchester Victoria to Llandudno, due 12:47, so, with most of the summer Saturday trains not running this early in the season, there would have been little to have stopped it leaving early. What did stop it was the presence of 2D94 in the single line section across the Britannia Bridge. The driver has to call Bangor box from signal BR10 to determine the cause of the delay.